Joey’s 30th birthday was at the beginning of April and I couldn’t let the occasion pass by without knitting something especially for him. 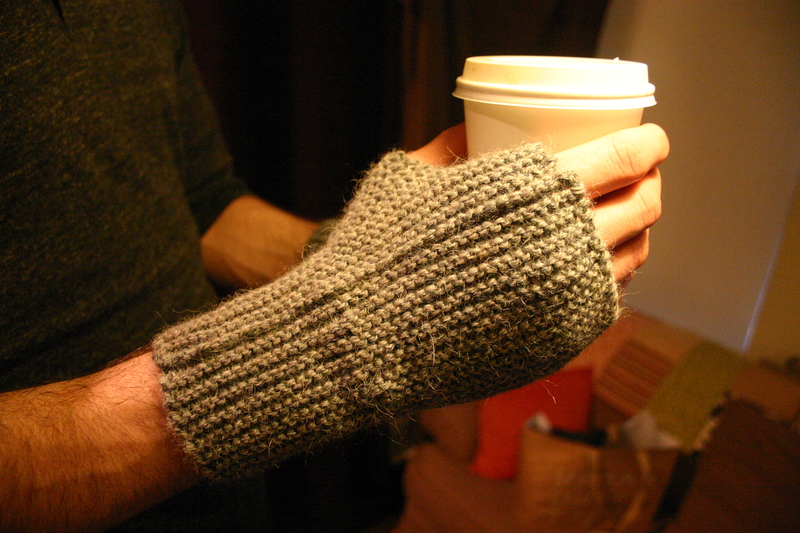 He has been requesting fingerless gloves for quite a while now and I’ve been wanting to try Ysolda’s Garter Stitch Mitts pattern for a while…. so it was a perfect time to cast on. I started on 3/28 and finished on 4/1, knit with Louet Eastport Alpaca which is soft with a bit of a fuzzy halo. Great pattern, pretty yarn. I’ve also cast on for another speedy project that I am quite enamored with at the moment- the Baby Sophisticate sweater. I’m knitting this one with Tahki Tweedy Alpaca, which is soft and tweedy and nice to work with. I almost want to cast on a similar sweater with this yarn in my size! I’m so in love with it that I spilled the beans to the parents-to-be last night and showed them pictures of it in progress, and they’re totally thrilled. 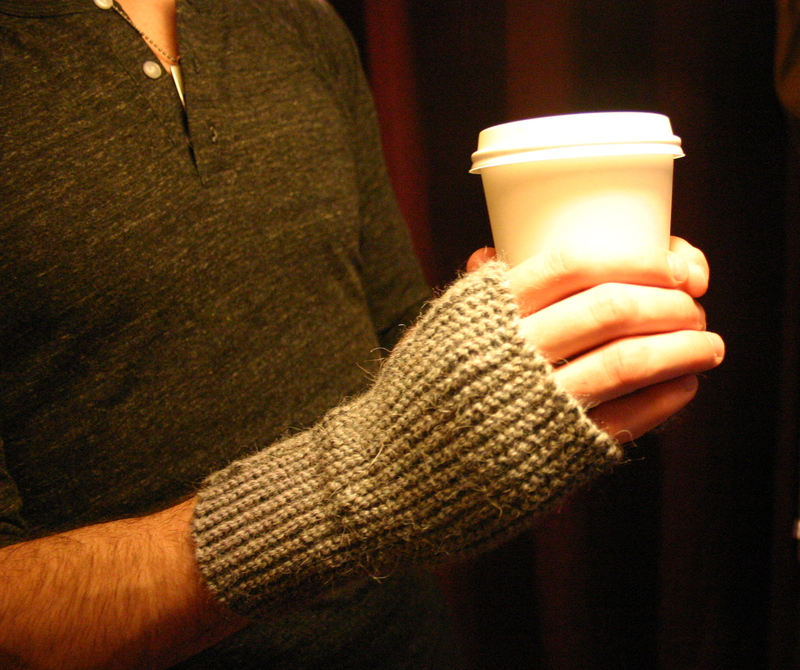 Love those manly mitts!! there’s something really pleasing about garter stitch. Cozy mitts! 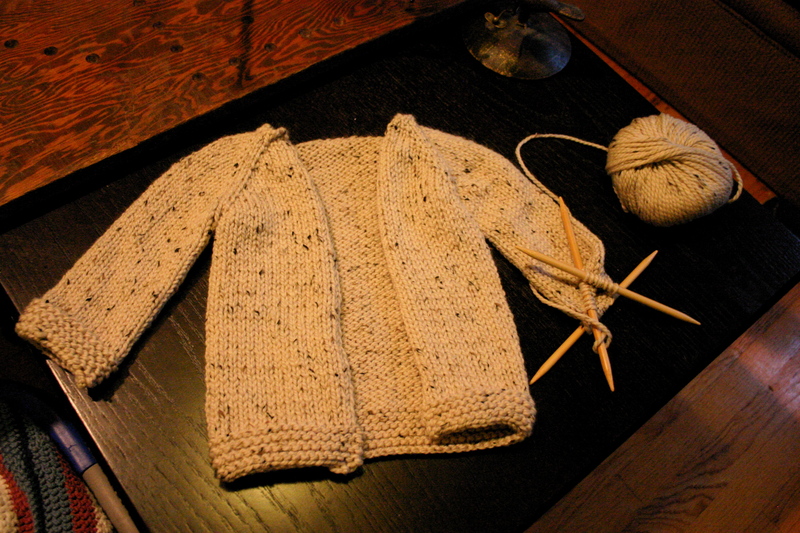 Can’t wait to see the finished baby sweater…so cute! Excellent knitting karma being built up there!